RightWay will be having our next OE cohort starting October 1st, Mondays and Thursdays, from 2-6PM. Call now and secure your spot! Food provided. We loved seeing all of our youth and supporters who made it to Highlights + Hope! Check out the video recap below or look in our gallery for some pictures from this special evening celebrating Foster Care Awareness Month. The RightWay Foundation is hosting an event to celebrate our youth and supporters. We will highlight the past 7 years through youth alumni spoken word, a photo booth, a few awards, and great drinks and appetizers. Together with youth, attendees, and child welfare professionals, we will list our hopes for foster youth in the daily challenges they face (homelessness, incarceration, unemployment) and how we can all work collaboratively to improve their lives. We will make the night meaningful and inspirational, full of hope. Join us for this night of awareness and celebration! Too many foster youth suffer from unemployment due to involvement with the criminal justice system. Foster care is often a pipeline to prison, as 80% of men in CA state prisons come from foster care. We want to stop this statistic from continuing through access to employment services, mental health services, and other supportive services. Our upcoming ReEntry program, which will combine Operation Emancipation, career-track trainings, and placements for industries such as tech, construction, and automotive, is an opportunity that is one of the first steps in giving young people a strong career path and job skills. A difficult past should not be all that defines a young person's future. By providing our population with the tools and opportunities they need, we can stop the pipeline from foster care to prison. This program is open to youth ages 18-24 on probation or parole within the last 6 months residing in the following zip codes: 90005-7, 90011, 90012, 90015, 90018, 90021-23, 90027, 90031-33, 90037, 90042, 90063, 90065. RightWay will be having our next OE cohort starting February 5th, Mondays and Thursdays from 2-6PM. Call now and secure your spot! Food provided. We hope you all had a Happy Thanksgiving everyone! Tomorrow is #GivingTuesday, a time when we kick off our end-of-the-year giving campaign. #GivingTuesday follows Black Friday and Cyber Monday, and is a time to give back and show gratitude to others after this indulgent time of year. 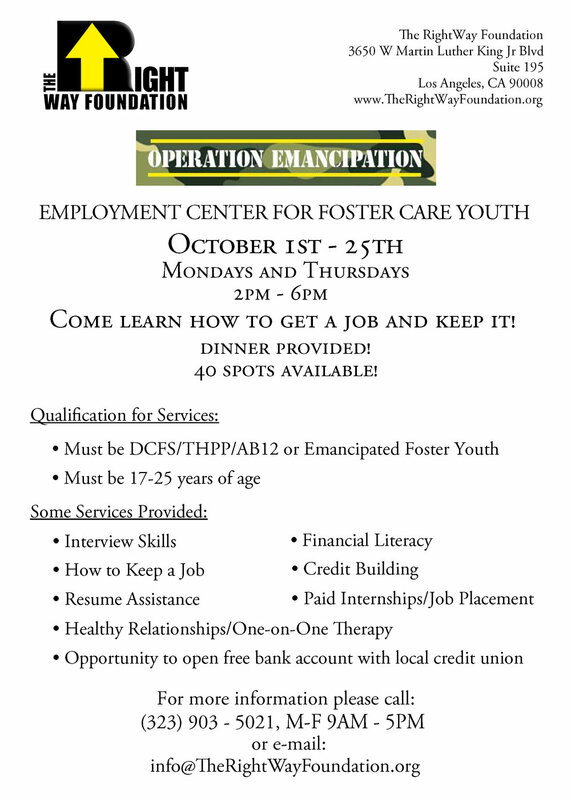 We hope you will help our foster youth through employment and mental health services. Please encourage people around you to give back this #GivingTuesday. Watch the videos below to hear why you should give to RightWay this upcoming #GivingTuesday. Thank you for thinking of RightWay and our foster youth! Before coming to RightWay, Keyanna was struggling to find jobs that could pay her rent. Now, she has a stable job that supports herself and her son, and is able to pursue a better future for them both. Self-sufficient youth like Keyanna still need the support of The RightWay Foundation, and donating to this page will build foster youth futures the RightWay. Tyeiona is completing an internship through RightWay and has been coming into RightWay's office almost weekly for years. She is always pushing towards her future goals, and is a student at LATTC. Motivated youth like Tyeiona need your support this upcoming #GivingTuesday, 11/28. Give on our page here to build youth futures. The above video is a message from our Executive Director and Founder, Franco Vega, about RightWay and #GivingTuesday. We will be recognizing all donations of $500 or more in our center permanently. Click here to participate and build foster youth futures the RightWay. Through the generosity of PBS SoCal, The RightWay Foundation was able to send 8 film interns to help shoot, produce, and edit films that were screened at Real to Reel, an annual film festival held on October 7th this year. Real to Reel film festival, put on by Better Youth, Inc., focuses on bringing attention to youth perspectives on social issues through media arts and culture. Better Youth Inc. is a non-profit whose mission is to transform youth by validating skills through mentoring and media arts training. This year’s Real to Reel, the third annual installment in a growing tradition, was especially powerful because many of the featured films were created by foster youth. The two founders of the film festival, RightWay alumna Johna Rivers and her mentor Syd Stewart are passionate about allowing foster youth the chance to tell their own stories through film. Using film as a powerful tool for change, they hope to showcase the diverse, but often underrepresented voices of youth who have been through the foster care system. The festival was a star-studded red carpet affair at the Los Angeles Film School. In the morning, youth had a chance to attend workshops hosted by experts in acting (Akuyoe Graham, award winning actress), new media (Ruben Garcia from AT&T), and financial literacy (Wells Fargo). After the workshops, everyone enjoyed a day of panels and screenings. Special guests included actors Caitlin Ashley Thompson (MTV's Scream Queens), Monique Coleman (Disney's High School Musical), Alex Cubis (Disney's Mako Mermaids), and Sara Barrett (CBS's Criminal Minds). Leah Daniels-Butler, casting Director of FOX's Empire, served as a panelist and was presented with a surprise award by Real to Reel acknowledging her work as a celebrity guest mentor. For the film interns and other foster youth at The RightWay Foundation, having a chance to tell their own narratives is significant to their personal growth. Film and other forms of art are important tools for fulfilling our commitment to helping current and former foster youth "move from a point of pain and disappointment to a point of power, productivity, and self-sufficiency." 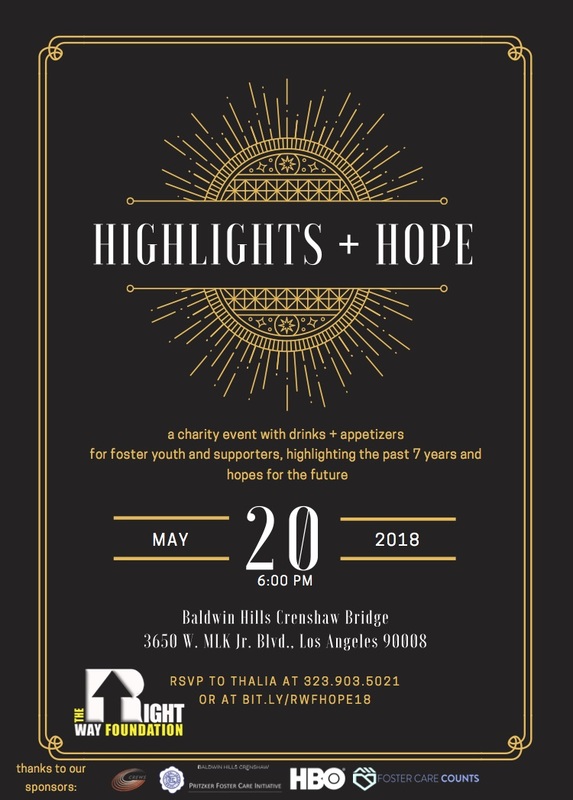 By giving youth the agency to express themselves, The RightWay Foundation and Real to Reel hope to combat the feelings of pain and powerlessness that many former foster youth face. Arts programs like the film internship and Real to Reel not only allow our foster youth to share their narratives, but also shed a personal light on systemic issues in foster care. Through the creative process, youth find power and validation. Creative outlets are not always available to foster youth, but we believe that they should be. The RightWay Foundation wants to thank PBS SoCal To Foster Change Initiative for sponsoring our film internship program. Through their internships, our youth had the opportunity to gain technical knowledge in the filmmaking industry. More importantly, they gained tools to continue to express themselves creatively. The RightWay Foundation would also like to thank Real to Reel film festival, Better Youth Inc., and all of the mentors for giving a voice to our youth and helping them share their perspectives. We are glad to know that there are platforms for the important stories they have to tell. To view the films from the festival, visit https://www.facebook.com/realtoreelglobal/. We are so excited to continue supporting our youth in their creative endeavors! The holiday season is almost here! Because this can be one of the toughest times of year for our youth, we support them with many activities to brighten their spirits such as going to the movies on Christmas Day or attending a home-cooked feast at a local church on Thanksgiving. These events take a lot of support to be successful, and this year you can help donate to these outings through purchasing your holiday cards. If you want 50% off holiday cards and to support The RightWay Foundation by sending out a card to your friends and family, you can buy a special "Cards for Causes" through Picaboo Printing. You can get started on your card here. Customize it however you like and enter the code "Cards4Causes" at checkout. Thank you for supporting RightWay and our youth! In our last newsletter, we highlighted one of our successful young alumni. Below is her story. Michelle Angel, who was in our first cohort of Operation Emancipation, is now in the U.S. Army as a Specialist maintaining the computer systems and accounts inside tanks. She came back to say hi to Franco and the team and let everyone know how it is going so far. She is currently stationed in Kansas but has been in Korea, Georgia, and South Carolina. We are proud of her and her service. Michelle has overcome a lot in her life to become the successful woman she is today. She was in foster homes by the age of 2 until the age of 7. She moved to Mexico when her grandparents on her father's side took custody of her and her 6 siblings. After switching schools often and moving around a lot, she came back to the states when she was 15 to live with her mom. At the age of 18, she was on her own and found her way to RightWay's first OE cohort. In a workshop facilitated by TJ Maxx executives, Michelle received a gift card for $100 to purchase interview clothes for a mock interview on the last day of the workshop. She showed up prepared and interviewed well, finding out the "mock interview" ended with a job on the spot. She worked at TJ Maxx for two years until she joined the Army in February of 2015. Michelle is going to continue her certifications in the IT field through the Army, and work her way up while building her skills, until one day she can work for Northrup Gruman (who makes the systems used in U.S. Army tanks). She is a strong, joyful, inspirational young woman and we can't wait to see where she goes from here. The RightWay Foundation's program Operation Emancipation will have two cohorts during September. The first will be the week of September 11th-15th 10AM to 4PM and the second will be September 25th to 29th 10AM to 4PM. Food will be provided. Come join us on Wednesday, August 9th, for a Do&Co job fair! There are many positions open, including warehouse/packing jobs. We look forward to seeing you at the hiring event. What is 8 To Stop 80? A way to support an end to the 80% of men locked up in prison coming from foster care. A movement that will cost you less than two lattes to know you are making a difference. A guarantee that young men leaving foster care will have jobs and housing, not desperation and incarceration. $8 a month can start to end the epidemic of young men from foster care ending up in prison, one at a time. Stop this foster care to prison pipeline yourself. Today The RightWay Foundation is opening a new house for young men who grew up in the foster care system, thanks to the support of the Pritzker Foster Care Initiative. The home is a beautiful Craftsman style house with hardwood floor. This house is going to have a relaxing meditation/fitness room. We will be housing nine young men that will bridge a transition to independence and more permanent housing. They will pursue education and career-driven programs like Year Up, and will have access to RightWay’s proven employment and mental health services throughout their stay in the home and beyond. RightWay will be hosting workplace resolution groups and wellness meals, to encourage a safe environment in which youth can troubleshoot workplace and personal issues. The focus of the home will be holistic health and wellness, with the supportive services our youth need to thrive. Moving into housing services is a fulfillment of the need RightWay sees every day. Many foster youth coming into our center on a daily basis, most of them homeless. Although, for years, we have scrambled to find them housing through wonderful partners like Good Seed CDC and Sanctuary of Hope, the amount of homeless youth only seem to continue to increase. We are looking to expand the number of beds available specifically for foster youth, and ensure these young people can successfully reach self-sufficiency. For our youth, finding a job and being hired has always been the easy part, especially with the training youth receive through Operation Emancipation and RightWay’s close ties to companies such as Crews 1972, AEG, and HMS Host. But once on the job, many youth face housing crises and other personal setbacks that can affect their job performance and maintenance. Stable housing is one of the most common reasons our youth are unable to stay at a job-- so, this housing program will have the goal of reducing turnover for employers and keeping our young employees at their jobs. This house will have some rules to encourage and facilitate exit to more permanent housing, such as no drugs or alcohol on-site, no guests, and required payment into a savings plan. But, we are sensitive to our population and understand the needs they have. Supportive, harm-reduction housing for foster TAY is necessary. We cannot expect our youth to go to school, find long-term jobs and succeed without a stable place to stay. We cannot kick them out due to indiscretions any young adult will have because there are not enough beds to take them back in. There must be informed discussion about past mistakes and how to resolve problems effectively, through therapy and crisis intervention, but not through devastating consequences to their future. We must give second chances. Any parent will give their own children much more than a second chance, so because LA County foster youth are the children of RightWay, we believe it is our duty to make sure they receive as much support as they need to jump as high as they want after exiting foster care. Although this house is mostly funded due to the generosity of Pritzker Foster Care Initiative, we are looking for investors and locations for future housing programs in South Central LA. For our tenants, donations in-kind of materials such as soap, paper towels, desks, cleaning supplies, dishes, and anything else a young man might need related to housing would be very useful. If you would like to be a part of this exciting new venture in any way, please fill out this form here. Thank you in advance for supporting our foster youth. Job Fair for LAX Crews Restaurant Jobs on Tuesday, February 28th! The RightWay Foundation will be hosting a great job fair on the 28th from 10-3 in the mall's Community Room! Come ready for some awesome LAX jobs in many different restaurants through Crews 1972. RSVP to the address or number on the flyer, print a resume, wear interview clothes, and bring a good attitude and you could have a job before the end of February. Saturday, March 25th, from 10AM to 1PM there will be plenty of opportunities at this huge job fair! Please register now and prepare for this event to interview with many employers. Our partner site, Boyle Heights Technology YouthSource Center, is hosting a job fair for LAUSD jobs in the technical, administrative and professional areas. The job fair will take place tomorrow, February 14th, from 1-5 pm at their center in Boyle Heights. This is a great way to acquire a beneficial government job and start a career that makes a difference! At the end of last year, on December 27th, 2016, The RightWay Foundation lost a great student and the world lost a great man. 20-year-old Anthony Nelson III was killed in East LA, across the street from where he was living. Anthony was an alumni of The RightWay Foundation's program, Operation Emancipation, and participated in our first cohort with LA's Department of Cultural Affairs as an intern in the Creative Career Pathways Program. He was placed at Armory Center for the Arts, where he thrived in his creative projects and tasks. At the culmination ceremony, Anthony received a certificate from the Mayor's office that celebrated his completion of the program, which remained on his wall along with his high school diploma until the day he passed. He was proud to be an alumni of the Creative Career Pathways Program and was going to continue into the music industry, where he was able to gain experience as an intern in the Boyle Heights Technology YouthSource Center's recording studio. But beyond his accomplishments that were moving him towards a career in the arts and music, Anthony made an impact on all the people he met. Anthony was one of the most optimistic people I knew! I met him at The RightWay Foundation. No matter his situation, he would always find a silver lining; even if the silver lining was dull. He found a way to brighten it and share it with others. He was full of hope and dreams and he wouldn't let any setback get in his way. He was very patient, kind, and had a gentle spirit. I saw him Dec 24th, 2016 at the Annual Pathways Christmas Party and he greeted me with a BIG SMILE, as he usually did. He had on a bright red bow tie and we exchanged how happy we were to be apart of the event for another year :) He wore a smile even in the rain. He was extremely happy to be living in his own space and looked at it as a way for him to gain a foundation in life; He was surrounded by supportive people who also shared his vision. This young man is gone way too soon. It is a blessing to have been able to meet and work with this special human being. Rest In Peace, forever more. Anthony was loved by most and respected by many. Anyone he came across would leave with a warm heart. Anthony loved making others smile even if he was feeling down. He always found a way to get through the ruff times without losing his focus on the goals he wanted to accomplish. He had such a beautiful soul and I was truly blessed to have been apart of his life. You will be truly missed but never forgotten. May you rest in paradise. Anthony Nelson was a young man who was bettering his situation for himself. He was too young, at 20, to be taken from this world, especially in such a violent way. The RightWay Foundation attended his funeral a couple of weeks ago and is providing therapy to anyone who needs to talk about this loss. We know his sister, family, and all those who knew and loved Anthony will carry on his memory.